The princess and a boat called Roy. – Dirty wet dog , boats and sailing. ‘Rob Roy’…… to be more precise. In my first long video post of this year i talked about my canoe connection at both ends of that video. That wasn’t just bad editing on my part, it was nice to be able to talk about my friend Ray Goodwin (MBE) and that connected neatly with my renewed interest in the sailing canoe. My own interest in the canoe came about almost accidentally and only after i had done some trips and training in sea kayaks. I thought that with some knowledge of the sea and especially tides, then i would take to the sea kayak well. I thought then that all i really had to learn was the basic ‘how-to’ of paddling the boat and i would be away….i even looked at doing a long independent paddle around the UK. Although i enjoyed the trips that i did complete, especially in New Zealand, i never achieved the level of competency that i really needed to do the kind of paddling that i wanted to. My main problem then, and still true today, was that my various back injuries make it extremely difficult to do an Eskimo roll self rescue. Well….i can do the first part fine, the capsize part, it’s the roll back up that i can’t do !. Kayakers and a neat gaffer in the Yealm. My time with the open, or Canadian, canoe began one miserable wet day in a book shop in Southampton. It must have been between voyages or maybe just after i finished sailing professionally, i don’t remember exactly. What i do remember doing was browsing through the outdoor’s and maritime literature section which gave very poor pickings for a major port city. Rather than anything to do with sailing the only book that got my attention was a large format softback with a very appealing picture across the covers : just a canoe and it’s paddler on a misty lake somewhere wild. That book was the inspiring ‘Song of the Paddle’ by the late Bill Mason : artist, writer, film maker and compulsive canoeist. It’s said that Bill would get tetchy in his job in the spring and then just disappear into the Canadian bush for weeks and months on end in his trusty red Chestnut canoe. I have to admit that i feel the same way about sailing, as soon as it’s light enough in the morning to not need headlights driving to work i’d rather be heading to the boat. Bill Mason also wrote and illustrated other books including his own manual of canoe techniques : that’s ‘Path of the paddle’ which i also have. I did, for a while, have a copy of his best film ‘Waterwalker’ on old style video tape. It’s a normal mistake to think of kayaks and canoes as being the same thing, i often hear them mixed up. Today there are not only kayaks and canoes but several different categories within each type, thus within kayaks there are river/touring kayaks, more specialised sea kayaks, general purpose river running kayaks and then the ‘freak’ boats such as ‘play-boats’ and ‘boof-boats’. For me it was always and only the native derived open canoe and the similarly derived sea kayak that made any sense. These both being boats that had evolved over long periods for a specific purpose : that being primarily wilderness travel and sustenance hunting in the regions they were built for. Much later i came across the ‘third canoe’ as i call it which is hardly known in the northern hemisphere at all : that one will have to wait for another post. Just for easy reference i will quickly describe the 2 principal boats. Sea kayak. Directly derived from the native Inuit craft of east and west Greenland. There are several principle variants but the main design was a long and slim boat often little wider than the paddler’s hips, very low in the water and with a small cockpit that could be closed with a skirt. The boats are usually fine ended, a solo boat could be anything up to 21 feet in length and most often paddled with a double bladed paddle. Most boats were designed and built around just the one paddler although there were some longer and wider boats ‘Baidarka’s‘ that could take the whole family on long voyages. The modern sea kayak tends to come in at around 16-17 feet long and are designed around larger and longer legged paddlers….i for example can’t get my legs into a traditional boat. Modern boats tend to be moulded GRP or composites although there are many nice home built plywood or cedar-strip boats around. I know of a couple of guys building traditional ‘skin on frame’ boats although the ‘skin’ tends not to come off a hapless seal these days ! Modern GRP boat and Inuit style paddle. The canoe as a type appears historically in several places around the world roughly in similar eras. One canoe made from a dug-out log is known from Poole harbour in Dorset UK which would have been an excellent craft for trade, travel and fishing in that shallow water area. That boat is estimated to be about 2,200 years old, made from a single oak tree hollowed out. It’s thought likely that all early canoes were little more than a floating log hollowed out in the middle a bit…..long and tedious job with even the best stone tools and a carefully managed fire. More famous and much better known are the many variants of the open canoe made in the northern/eastern woodlands of the now USA and Canada. Probably originally hollowed out logs but a new technique was worked out there using large sheets of the bark of one specific Birch just like flexible sheets of plywood. That became the native Birch bark canoe, very light and supremely suited to it’s task. It’s said that a good woodsman could go into the woods with just the most basic tools and after a few days work appear again with a complete canoe and a new paddle. The building of the native Birch bark canoe actually improved with western technology…..better tools mainly…..and then western boatbuilding methods were applied to build canoes more like small fishing and rowing boats. The canoe as we know it today is usually around 16 feet and is a completely open boat with a seat at each end and a thwart in the centre. Most boats made commercially now are in some kind of moulded plastic or polypropylene although some wooden boats are still made. Canvas covered wooden canoe were made en mass at one time although now it tends to be a smaller artisan outfit and the boats tend to be around 3-4 times the cost of a plastic boat. It is of course easily possible to self-build a plywood or cedar strip canoe and my first experiences in learning to paddle were in ‘strippers’. What is little known is that although most open canoes were similar in size to what we generally paddle today there were also much larger canoes in general use in the north country of Ontario: these being the equivalent of the truckers boats, or voyageurs craft, of the great waterways of the north. The Poole ‘log’ boat itself may have been 8 metres in length and good to carry a dozen people or around a ton of trade goods. Well….sorry for the long introduction to the main content but i know that most folks won’t be that familiar with the canoe and the kayak. If western boatbuilding techniques and better tools changed the way that canoes were built it also brought something new to their use in that the working canoe, the prospector’s or trappers boats also became an inexpensive leisure craft. The true sea-kayak didn’t really appear as a leisure craft until much later on. The sailing canoe as it developed and as it is now is kind of a hybrid craft sharing features from both canoe and kayak. I will often refer to the later touring canoe and it’s sail assisted offspring as ‘The poor mans yacht’ : that title actually comes from an article in the US magazine ‘Field and stream’. Here, below, at the Adirondack museum in the USA that very title is used at the display of kayaks and sailing canoes. In the foreground is what looks like a skin on frame Unuit kayak and the beautiful sailing canoe is, i believe a Rushton ‘Vesper’ model. Also at the museum is another Rushton boat set up in the display with it’s camping tent rigged and that’s the ‘Princess’ of the post title here. I think this photograph is credited to Barry Long. The connection here is that a new canoe type appeared during the mid to late 19th century that seems to be a hybrid between native canoe and kayak shapes married with western boatbuilding technology and sails. It’s difficult to trace the first boats of this kind in the USA as there appear to be several interim stages of boat development. In the British isles it’s possible to trace the new type of canoe right back to a fully proven boat with the several canoes named Rob Roy designed and paddled/sailed by English barrister John Macgregor…..also often known to his family as Rob Roy. Readers whom have been following my new video series will know that i have briefly mentioned the Rob Roy sailing canoe in connection with L. Francis Herreshoff who designed his own version. That boat appears as a design in Herreshoff’s book ‘Sensible Cruising Designs‘ , which will be the subject of my next video review, and he mentions the type in his cruising story ‘The Compleat Cruiser‘. In the latter book he describes the Rob Roy style canoe as the smallest possible cruising boat and goes on to argue for it’s use . Reading the history of that type of boat today it does seem that there was a short period of real enthusiasm for the sailing canoe but that it’s heyday had already passed by the time Herreshoff wrote his book. Today there is a resurgence in interest for the sailing canoe and there are several really exciting projects going on and some beautiful recreations of original boats. In his book ‘The compleat cruiser’ Herreshoff uses several of his characters to ask a question and then seems to write himself into the story as the narrator and to answer the question. In this section ‘young Briggs‘ is used to pose the question. “I suppose,” said Goddard, “about the smallest successful cruisers were the several canoes named Rob Roy that John Macgregor designed for himself and in which he made his famous cruises during the 1860’s and and 70’s…..
From The Compleat Cruiser by L. Francis Herreshoff. In the UK at least there is an open canoe sailing group with some enthusiastic paddlers and canoe builders . One of the members of that group kindly contacted me to let me know about boats for sale via that group. L. Francis Herreshoff in one of his own canoe designs. So, lets take a look at the original boat and it’s designer in the UK : John Macgregor and his canoe Rob Roy. As a potted history….John MacGregor had been an army officer but by 1860 was working as a patents lawyer in London when he conceived the idea of designing and building a canoe for long distance touring. By all accounts he was a good draughtsman so he designed the boat based around the maximum dimensions that would go inside the guards van of a train. The boat was then built by a maker of river skiffs because they were one of the few companies capable of building very light boats. The first boat came in at around 77 pounds and was made from cedar planking over steamed oak ribs. In 1865 MacGregor made a thousand mile journey through the lakes, canals and rivers of Europe and went on to write a book about the experience : the book and the concept being an instant success. That book ‘1,000 miles in the Rob Roy canoe‘ was the just the first of 4. Canoeing became an almost instant and overnight new obsession among the middle and upper classes in the UK. In 1865 MacGregor formed the first English canoe club and even English royalty got in on the act. The story of what happened next is something i am going to pick on in a parallel post about the development of the canoe yawl in the north-east of England, for now what i want to focus on is the story of the sailing canoe today. If you are interested in MacGregor’s writing the books are available online in several formats. I spent a couple of nights going through them but found little that was of value to me as a potential owner and builder. Most of his writing is a kind of travelogue of it’s time, his observations about the places he paddled though and the characters he met. There is better writing about the canoe out there and even in L. Francis Herreshoff’s work where he at least talks about the design, building and paddling of the basic craft. My renewed interest in the sailing canoe is largely due to the fact that i need a new way of exercising and that i would like to return to some very basic outdoors practice. As i have said in other posts i have been a sea kayaker and a canoeist in fact i worked as an open canoe coach for a while. Today i find that i can’t paddle an open canoe properly because i can’t maintain a kneeling position with weight on both knees. That’s due to having had a knee replacement this year. I can kneel, just about, but avoid putting much pressure on that side. I did consider a sea kayak again but there is something about the seating position in most sea kayaks that gives me intense back pain. 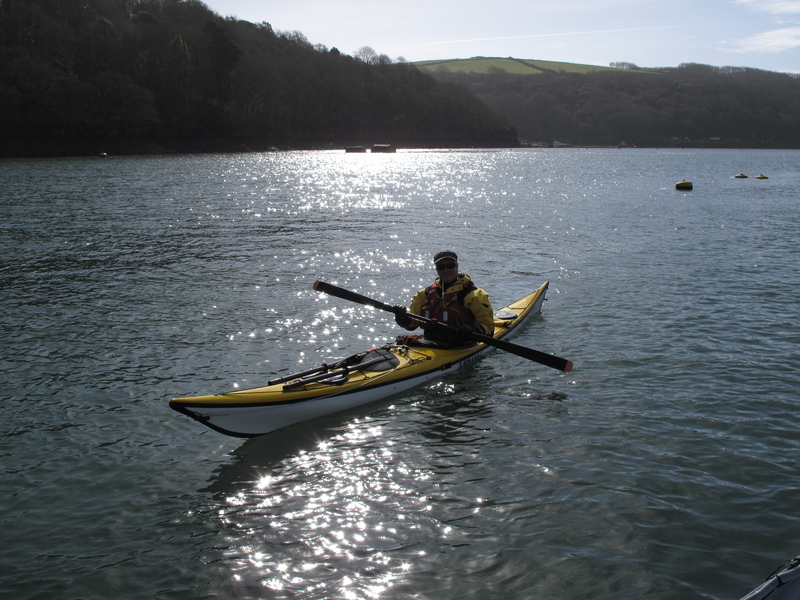 In fact, the last time i paddled a sea kayak i had to be assisted ashore and almost ‘poured’ out of the boat before i had enough sensation in my legs to be able to stand up. The one boat that did work for me was a double sea kayak intended for the paddling hire trade in NZ. That boat the Sea Bear ‘Packhorse’ had a very wide cockpits that allowed both of us to move around a lot more than the more normal narrow sea kayak does. It’s possible that with either a secondhand donor boat or building a boat from a kit that i could custom build the seating position to allow me to move around more like i can in the open canoe. Iain Oughtread designed sailing canoe, unknown photographer. Today, the custom built, MacGregor style boat is still unusual to see out on the water and i guess mainly because no-one is building them commercially. What many canoeists and sea kayakers do is improvise rigs for their boats. I have seen several canoes that utilise the rig from an Optimist dinghy and several more that use a specially made canoe rig. It’s not such a big deal to fit a sailing thwart into an open canoe and i did consider that except for the same problems as i described above. Today there are several companies offering kits of their own designs or who can do CNC panel cutting for other designers work. The one that appeals the most because it seems closest to the original idea is one of Iain Oughread’s designs and one company at least offers a kit for the boat i would like to build. I almost have enough space to build one in the workshop if i move the storage shelves or make a temporary extension out front. It’s one project that would have to wait for warmer weather due to the known problems of working with epoxy although i could for instance get the kit, prepare the parts and dry store them in the house until i had made the strongback. Later in the year i might even be able to persuade Chris the boss to let me use a corner of his big shed as i would only need about 16 feet in length and about the same width as a dinghy. For my last mention today before i add my own video piece is this ongoing project by Chesapeake light craft. This boat they have custom designed for a project in the US and takes the Rob Roy canoe down a different route with a rig but also a paddle drive developed for Hobie’s adventure kayaks. Ps…the music is super-annoying : best muted and just watch the nice picture. At this stage i don’t think the boats look ‘quite right’ with, for example, too much freeboard in the middle….might just be my eye but the CLC boats don’t seem to be designed for paddling primarily. *2 touring canoe’s did come up on Ebay, both were a long way away, although i bid on one the bidding went quickly beyond my budget….having blown that on repairing the Pajero. One nice thing did happen in that someone saw a post of mine on another, canoeing based, website and contacted me about 2 boats for sale on that site. One is a complete Rob Roy style boat at just under 14 feet and one is a kit. I am very tempted by the complete boat although it’s only a 14 footer as i would then have a test-bed. I really want a 16 foot boat for it’s carrying capacity and that size of canoe or sea kayak i am well familiar with. It was nice to be contacted and hi’d though but. As i edit the post (February) before scheduling it for publication i am deep into the Liberty refit and the weather here is predictably cold and wet. It did cross my mind quite naturally to get set up with a canoe as quickly as i could and disappear off on my own thousand mile adventure……….then sense prevailed…….. While i can do many of the Liberty’s refit projects in a cold and damp workshop i wouldn’t be able to build a canoe out there so the longer project will have to wait for the autumn or an almost finished viable boat. Previous WABI”’ refit, 1 : Bring on the heat. Next From Tamar to Tolkien. Carry on up the Trossachs sounds like a good title for a film with Syd James and co ! 😀 It certainly does. Plenty of comedy moments in real life too, including my mate getting swept away down the river without a paddle by fast running flood water while I chased after him with said paddle just after we’d put-in and, later, me poisoning myself with Coleman gas fumes after trying to cook in my tent — you live and learn that’s for sure. Whatever happened to great comedy ?